^ "The Great Strike". The National Guardsman. New York: Charles A. Coffin. I (2 (Supplement)): 37. 1877-09-01. 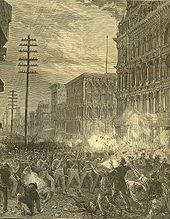 ^ a b "The Great Strike of 1877: Remembering a Worker Rebellion". UE News. June 2002. Retrieved 2008-05-25. ^ Zinn, Howard (1995). A People's History of the United States 1492-present. New York: Harper Collins. p. 248. ISBN 0-06-052842-7. Retrieved 2009-10-05. ^ Cutter, William, ed. (1913). New England Families, Genealogical and Memorial: A Record of the Achievements of Her People in the Making of Commonwealths and the Founding of a Nation, Volume 4. Lewis Historical Publishing Company. p. 1841. Retrieved 2015-09-11. ^ "Hyde Park History". Retrieved 2015-09-11. ^ a b Cahan, Richard (2002). A Court That Shaped America: Chicago's Federal District Court from Abe Lincoln to Abbie Hoffman. Northwestern University Press. pp. 33–34. ISBN 0-8101-1981-1. Retrieved 2009-10-05. ^ "Baltimore and Ohio Railroad Martinsburg Shops". National Historic Landmark summary listing. National Park Service. Retrieved 2007-10-13. ^ "Great Railroad Strike of 1877". Historical Marker Project. 15 September 2014. Retrieved 2 June 2016. ^ "Roundhouses and Shops / Railroad Strike of 1877". Historical Marker Project. 27 September 2014. Retrieved 2 June 2016. "The Great Railway Strike of 1877 and Newspaper Coverage". Railroads and the Making of Modern America. University of Nebraska Lincoln. Retrieved 1 September 2016.